This band, made of suede, replaces the strap pads on the upper calf strap (#4, 5 strap) and helps to keep the brace suspended on the leg. Does this work with SE-4? Yes, the Anti-migration band is compatible with all Donjoy Rigid Knee Braces. I just received the defiance brace. I have worn it once to play basketball and once for a short jog. The brace keep sliding at any sign of sweat. It this an adjustment issue or should I get a sleeve? 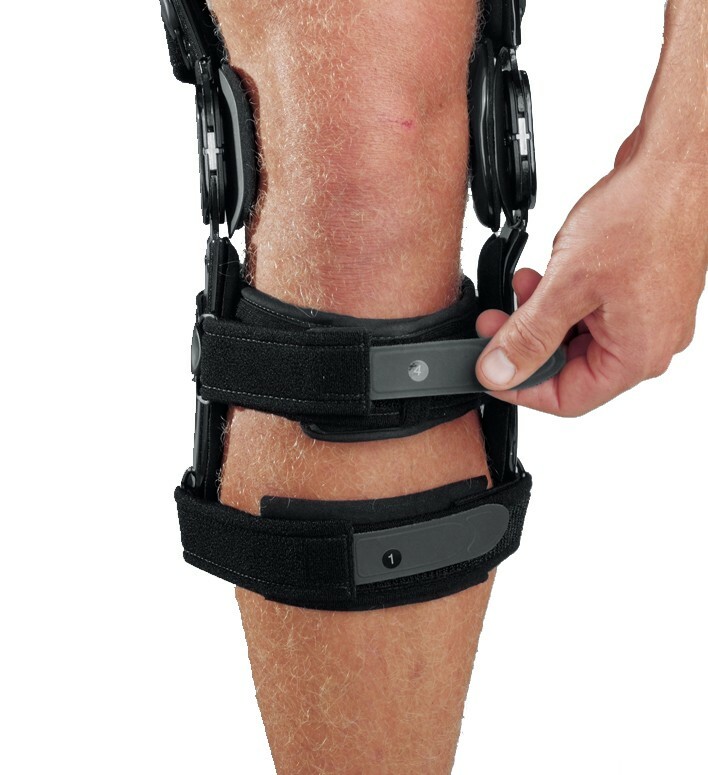 Question one: on my DonJoy ACL Everyday, does this strap replace #4 AND #5? Question two: on my DonJoy ACL Everyday will this still work with an under sleeve? Actually, the are where I have irritation causing the need for the under sleeve is under straps 4&5 - would having this strap mean I no longer need the sleeve at all??? That would be ideal so long as it will keep the brace in place without slippage. Thank you for contacting Better Braces. Question 1: The anti-migration would go underneath the #4 and #5 strap. Question 2: Its made so you can prevent slippage without wearing an under sleeve. It can still work with the under sleeve being worn also. Just to confirm strap#4 is the thin velcro strap that is over top of the larger strap that is wrapped directly under the knee? Would this work for the Playmaker II? Anything else to help it stay in place? I have a very old Defiance knee brace (13 years old) and I need to replace the pads for both 1 and 4 straps but I can't find the size of the brace to know what size to order. Where exactly do I find the size? can I just order a couple medium size pads? Is this the same as the OEM strap? I am not clear about what part of it issuede. Can this strap be used with the VQ orthocare Eagle and Eagle OA knee braces? Thank you! Thank you for your question. The DonJoy anti-Migration Band is designed to be used with the DonJoy rigid brace lines (ligament and OA). The Anti-Migration band is not known to be compatible outside the DonJoy line. So my brace is a large but the measurements im taking for this item is medium will this affect how the straps and my brace react to the anti migration band? Thank you for your question. A large is about 21" and a medium will measure 19.25". If the band that came with the brace fits you, you should go with that size. will this work with my 4titude brace? Hello, I have three braces (2 FullForce, 1 Defiance III), for all of them I need a replacement for the anti migration band. Is it the same for both models? (FullForce size is L, Defiance III is custom made). And, most important, can you ship it to Italy? Thank you for question. Yes the Anti-Migration for teh FullForce and the Defiance will be the same. Contact your rep in Italy to place your order. Brands: Aircast, Chattanooga, Compex, DJO Surgical, DonJoy, Dr. Comfort, Empi, ETI, ProCare. A product specialist will email you directly ppt slides for step by step re-attachment of the anti-migration band. I need to replace this anti-migration band and my brace size is a small. You do not offer the strap in a small, is the 16 inch option close or should I order a medium? Does this replace only 1 strap or does it come with 2 straps? This is only a single strap. I have the donjoy legend knee brace, its a little unconfortable so I would like to purchase items to make the brace more comfortable and not move around once I put it on. My question is I have a size small brace, what size of the Anti Mirgration Band do I need? The DonJoy Knee Brace size corresponds with the size of the DonJoy Anti-Migration Band sizing. A Small DonJoy Knee Brace would need a small Anti-Migration Band. This band really makes the brace all the more secure on your leg and it prevents it from moving. I'm not sure why the braces just don't come standard with these, just like the condyle pads. If you are paying 400 + you might as well get the best no? Either way, great band! Product is easy to install and use. Works as advertised. I've finally found something that keeps the brace in place during hot and sweaty soccer games! I had to stop often to push up and restart my brace in place because it kept slipping down. This extra strap was a HIT! I still have to pull up to adjust in place but not nearly as often as before. I wish the sales rep who measured me for my custom brace would've advised me to purchase one of these. It would have made my life so much more simpler. Bought an extra just in case. Pros: Simple to attach prevents brace slipping inexpensive for the amount it helps keep brace in place.